Want to see the thrifting score of the year? 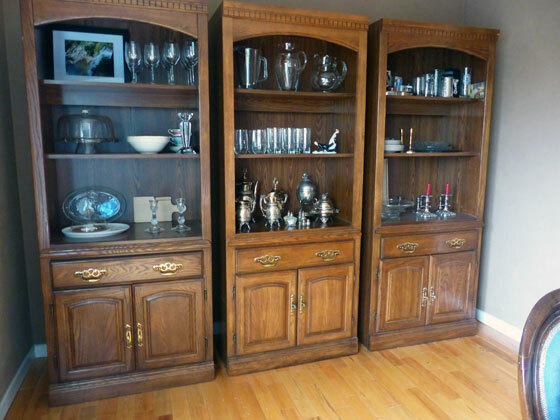 Last December I wrote about a pair of large bookcases I found at Value Village and my intention to turn them into a china cabinet in the dining room. I also wrote that I had really hoped to find three bookcases, but the store only had two (hence the 2/3 title of that post). More than six months later, in a different Value Village, in a different town, I came face to face with a bookcase. It looked like it might be the same as the bookcases we already had at home. 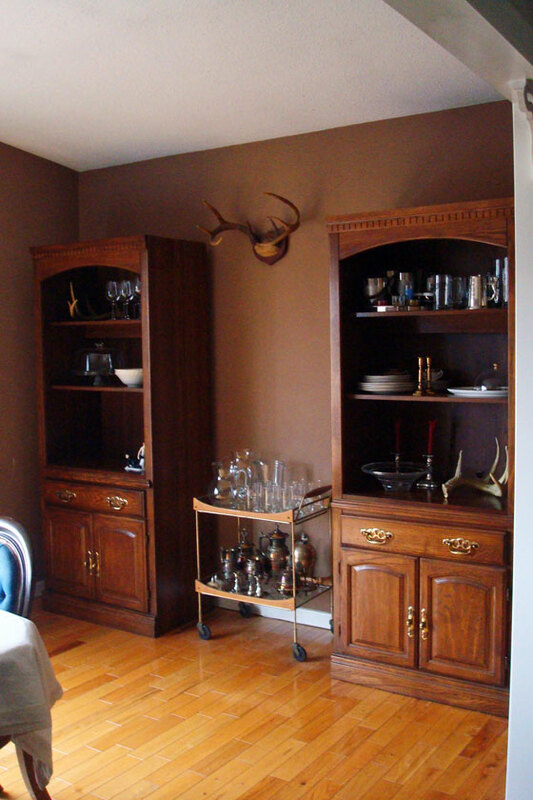 I actually called up my original blog post on my phone and tried to compare the pictures of the cabinets with the bookcase standing in front of me. I was pretty sure they were a match. In another sign that the universe was on my side that day, we were driving my Dad’s truck, so we had a way to transport the bookcase. And Matt had a 30% off coupon. When we placed it in the dining room, sure enough, it was a match. I still have plans to make over this trio, but when that day comes I will no longer have to build the middle section from scratch. For now I’m quite happy to have 3/3 of a china cabinet sitting in the dining room. 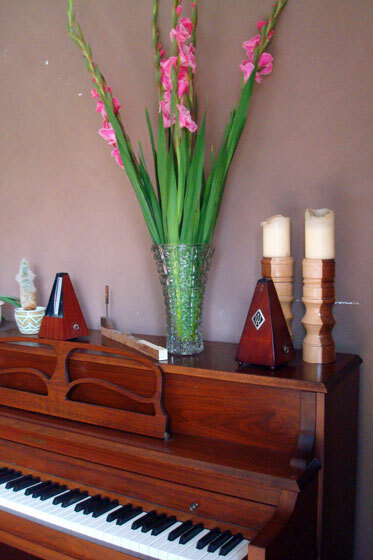 Searching for a spot to put the bouquet of very tall gladiolas that my Mom brought to the farm, I eventually found my way to the piano in the dining room. With the pretty flowers in place, I took the opportunity to photograph this piano, which joined our family about a year ago. It’s a new addition to Matt’s and my little family, but not to Matt’s extended family. It’s his Grandma’s piano. 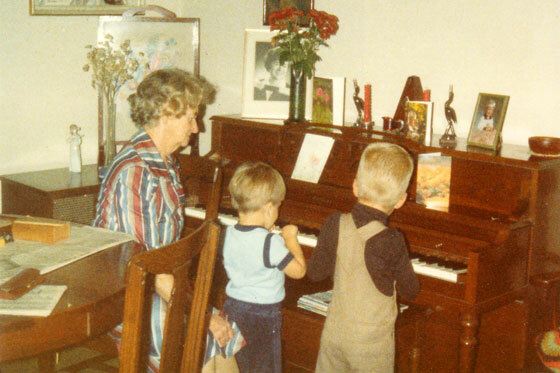 This picture shows her at the piano with Matt’s two older brothers. 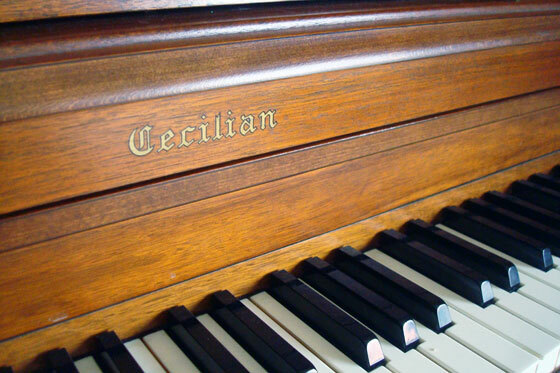 I played piano for many years, eventually earning my Grade 8 from the Royal Conservatory. My parents bought an electric piano for my sisters and me. A few years ago, they gave Matt and me the piano, which I really appreciated after not having a piano in my life for many years. However, I’ve always wanted a “real” piano. There’s something about wood and wires that was important to me. Last summer, Matt’s aunt gave us his Grandma’s piano. I don’t play that often anymore–and when I do, my fingers are so rusty that I spend most of my time on scales, chords and arpeggios–but I’m still thrilled to have a “real” piano and especially one with family heritage. 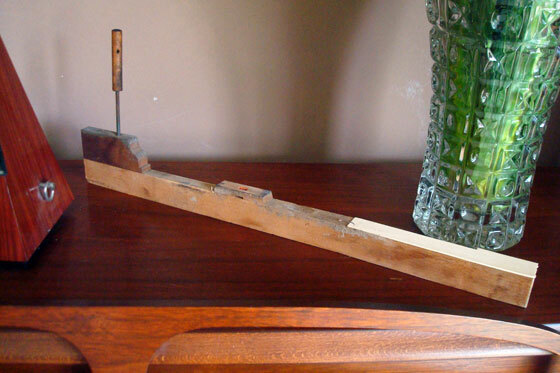 The arrival of this instrument led to a bit of a game of musical pianos in our house. My childhood piano moved to the basement. Its ability to play songs on its own and various other instruments aside from just piano is always a hit when the nephews come to visit. 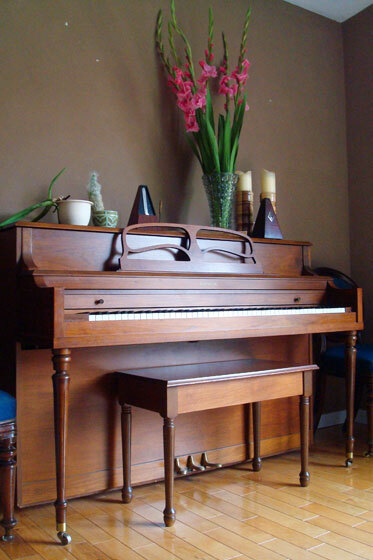 We also had a third piano–the one that came with the house. This piano has lived in the cold cellar since we did the basement reno. It was a monster–big, heavy, beat-up and badly out-of-tune. Even if we could have lifted it, it wouldn’t have fit up the stairs. But I was adamant about keeping it because it was my “real” piano. Well, once Mama’s piano arrived at the farm, I gave Matt the green light to get rid of the squatter piano. (Piano aficionados may want to skip the next part). The piano came out of the basement in relatively small pieces. The harp was still a monster to haul up the basement stairs. Matt did most of the work dismantling and evicting the piano. We have to extend thanks to my Dad, who dropped in for a visit and ended up swinging the sledgehammer and helping to carry the harp up the stairs. Then Matt’s Dad came by with his truck and helped Matt take the harp to the local charitable metal donation bin. 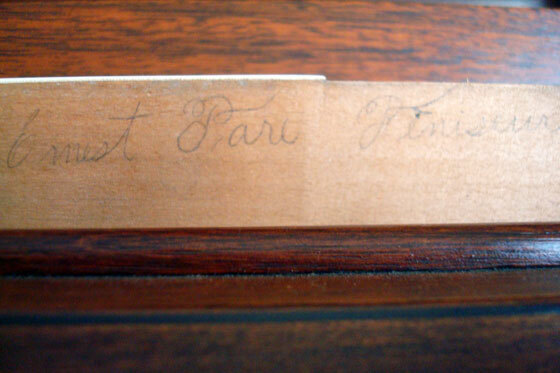 I did keep one piece of the old piano: this key, which now sits on top of Matt’s Grandma’s piano. On the back side of this key, there’s a very faint signature. I think it says Ernest Pare Feniseur. I’ve type the name into Google, but haven’t turned up any results. Decorating the rest of the top of the piano, I have our valiantly persevering cacti, a metronome that we found in the house, my Mom’s gladiolas in my grandmother’s vase, Matt’s grandmother’s metronome and two candlesticks turned by my Dad (topped with candles that were burned at our wedding). Yes, I’m just a wee bit sentimental. Together, they all make a pretty special corner of the house. Who else played piano growing up? Do you still play? Anyone else have a piano at their house?